Many SEOs have mixed feelings about Google Analytics… while it is regarded as being the best analytics tool, there are some who don’t use it because it is Google. Likewise, there are some SEOs that do use it, especially for popular sites, for the sole reason that they feel Google is using the information for ranking purposes. This was one of the many questions raised by Danny Sullivan at SMX Advanced earlier this month during the Google AMA with Gary Illyes. In the same conversation, Illyes also said they do not use click data from the search results in ranking either. When it comes to Google rankings, many are always looking for signs that Google is using data from one of its other products, whether Google Analytics, AdWords, AdSense, Google+ or any of the other many products they offer. 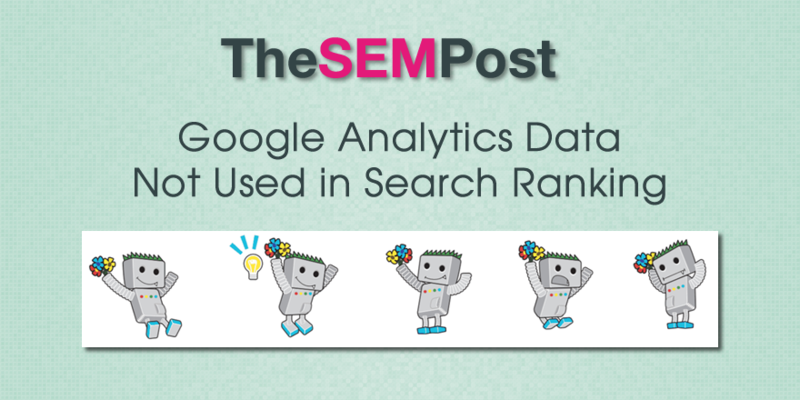 They have previously said that the use of AdWords or AdSense has no bearing on But according to Google, they do not use Analytics in their rankings. Added: Adam Singer from Google Analytics also confirmed it. OK, I’m confused. If Google doesn’t use their Analytics to determine how worthy a website is for ranking well, how DO they determine that? Aren’t number of pages visited and time spent on the site critical measurements from your audience? And isn’t the audience’s experience reflective of how worthy as website is for ranking well? Also, isn’t that especially true of the mobile experience now? We’ve all read in SEO blogs that Google demotes websites that aren’t responsive in mobile searches. Any insight you can share about these points would be most welcome. In advance, thanks for your time. This link reenforces what this article says – https://www.youtube.com/watch?v=CgBw9tbAQhU. @S J Sevell, I actually agree however I have read sites like this (http://www.custard.co.uk/is-google-using-bounce-rates-to-rank-websites/) that say they don’t. I have read in other forums a theory where the Google search team could conceivably measure from the time a visitor leaves the SERPs and enter a site, then returns to the SERP to look for another site and therefore tell how relevant the site was to the search term. I have not seen much evidence of “Google demotes websites that aren’t responsive in mobile searches.” – yes they said they would but I think they ended up placing “mobile-friendly” tag in mobile searches to let the users know which are mobile-friendly, this could result in more traffic from mobile devices, but I don’t see evidence of a drop in rankings yet, for this reason.